She graduated from philological faculty in the Kazakh-Russian University with a specialty “Kazakh language and literature” in 2003. Then she graduated from the Central-Kazakhstan University “MGTI-Lingua” with a specialty “Kazakh language and literature” in 2012. She works in KSTU since 2001.She taught at the faculty of pre-university training from 2003-2008. She has been teaching at the faculty of Preparatory Education.She has been teaching at the Faculty of Preparatory Studies Since 2013. 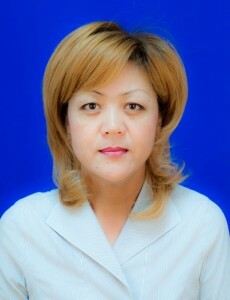 She conducts practical training of “Kazakh language”. She is the author of 3 textbooks: Kazakh language (Textbook on Credit Technology Systems). KSTU, Karaganda, 2004, Kazakh language (textbook for short-term study groups). KSTU, Karaganda, 2007.Professional Kazakh language (textbook for students majoring in Technological Machines and Equipment). KSTU, Karaganda, 2013, 3 electronic textbooks (Kazakh language certificate № 2913. 09.03.2011., Kazakh language certificate № 3802. 17.05.2012, “Kazakh language” (for independent work of students on credit technology system (TSIS), (computer program – eup) IP 00110663 Certificate of state registration of rights to the object of copyright number 1628 12/12/2013, 2 instructional guidelines: Methodical instruction for students of Architecture and Construction faculty of the Kazakh language. KSTU, Karaganda 2009, Collection of technical texts and dictionaries for students of Engineering and Construction faculty. KSTU, Karaganda 2009 and 1 Dictionary of Kazakh-Russian-English technical terms. Karaganda, 2004. She has more than 30 published works. She has a gratitude, a diploma from KSTU and a letter of gratitude from the Department of language development of the Karaganda region. Methodical instructions for students of specialties “Construction”, “Production of building materials, products and structures”.